At the butcher counter, you will see it in rolls, from which thin rounds are cut off, or in slabs, from which are cut rectangular thin pieces looking more like an English speaker’s concept of bacon. Either way, it is usually cut razor thin for you, so if you need it cut any other way, speak up quickly at the counter. 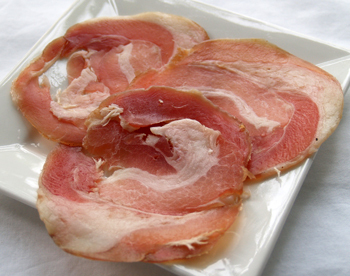 Pancetta magra is “lean Pancetta” (magra means thin: think meager in English.) If you need it cubed, then ask for it in a slab so that you can cube it. Rolled Pancetta is cured longer than slab Pancetta; the longer curing causes it to lose more water and taste a bit saltier. Unspiced Pancetta is technically “Pancetta cruda”, though people will just say “Pancetta.” In Southern Italy, a spicier Pancetta is also made. A dry spice mixture, which includes ground red pepper, is rubbed into the meat before salting. Italians will use the rolled Pancetta for sandwiches, and the slab Pancetta for cooking. They say that the rolled will lose its flavour when cooked. When cooking with Pancetta, especially rolled which is a bit saltier, adjust the salt in a dish at the very end: you may need a bit less than you think owing to the saltiness of the Pancetta. Unsmoked bacon. You want a good, fatty bacon, and the good news is, these are usually the cheapest ones around. In North America, use regular, unsmoked bacon; in the UK, use unsmoked, streaky bacon. Wrap tightly in plastic wrap so that it won’t dry out, and refrigerate for up to 3 weeks. Or, freeze for up to 1/2 a year. Pancetta comes from the Italian word “pancia”, meaning belly.